Vintage 1986 Forevers knitting patterns. Includes 4 Womens pullover sweaters and tops.Original knitting patterns not a copy. Includes only the pattern not the completed item. 100's more listed. Inventory box 13. 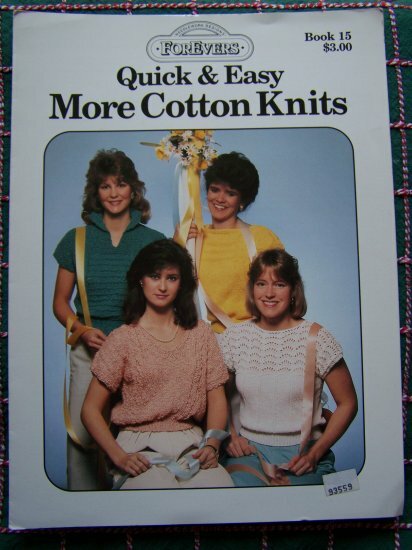 Pattern name: Forevers QUick & Easy more cotton knits book 15. ~~ NOTE ~~ Pattern looks like new, no writing. Large about 8 1/2 x 11" size 2 page card stock type pattern. Measurements: All have bust 32 - 48". S & H to the USA is $2.00 mailed flat. I can fit quite a few of these patterns in a priority flat rate envelope for only $5.00 shipping.